Whether you love them or hate them, Chelsea deserve to be champions. Adding their Capital One Cup triumph over Tottenham, they beat Crystal Palace 1-0 to win their fourth Premier League title. Throughout the whole season filled with thrills and turbulence, Chelsea fought their way through every obstacle. It’s a far cry from Jose Mourinho’s first season back where they only finished third. Back then, Mourinho was missing a few pieces that led to them not showing their usual best when he first took charge. After acquiring Diego Costa and Cesc Fabregas from Atletico Madrid and Barcelona, the puzzle was complete. In the first half of the season, they were relentless in their attack with Fabregas utilising his passing ability, and thanks to Nemanja Matic doing his job as a holding midfield and Diego Costa’s finishing coupled with the mazy runs of Willian and Eden Hazard, they scored a lot of goals. This fluidity of the attack resulted in Chelsea getting goals especially in situations where they don’t even look like they’re scoring. Even when their top scorer, Diego Costa, was injured, they showed that they don’t heavily rely on him with the teamwork they used to keep scoring. Their attack earned praise from the media and perhaps made their competitors envy with their front-line. Chelsea’s other acquirements such as Loic Remy, Filipe Luis and Juan Cuadrado joining during winter and getting their hero Didier Drogba back for free added more depth to a squad with title ambitions. Mourinho can afford to rotate his squad with the players he had in the beginning of the season, but after going through the first few games undefeated, the ‘Special One’ sees no reason to do so and kept playing the same side until injuries or suspension forced his hand otherwise. In the second half of the season though, Mourinho started to change tactics sensing that his gameplan got found out after they suffered a 5-3 demolition thanks to Tottenham. From attacking fluidity, Chelsea changed into a defensive wall. With the defensive unit of Branislav Ivanovic, John Terry, Gary Cahill and Cesar Azpilicueta, they gave what Mourinho wanted, shutting out any space that their opponents could utilize to attack as they were compact most of the time with Matic sometimes chipping in to help out the defenders. Even when their line got broken, their keeper Thibaut Courtois would prevent the opposition from getting the goals. However, this kind of tactics drew annoyance and labeled Chelsea’s brand of football as boring. Is Mourinho fazed? Not one bit. No matter who criticizes him, he will always hit back, with Wenger being the frequent target. This shows the stubbornness of Mourinho, and no pressure from other managers, media and other clubs’ fans’ hostility will push him to abandon his approach. After all, if this kind of play can give him the vital 3 points, who can blame him? He kept playing defensive tactics and it kept working. As a result, this enabled Chelsea to steal the win from creating a goal out of nothing. Ask Man. United, Everton and Queens Park Rangers. They were left frustrated after giving Chelsea a hard time and wound up being the losers. After playing 35 league matches, they finally got the job done on Sunday thanks to Eden Hazard scoring the only goal that lead to Chelsea winning the Premier League title. But even with the title race done, there are still other aspects of the league that need to be resolved. As for Chelsea, they can afford to relax now. 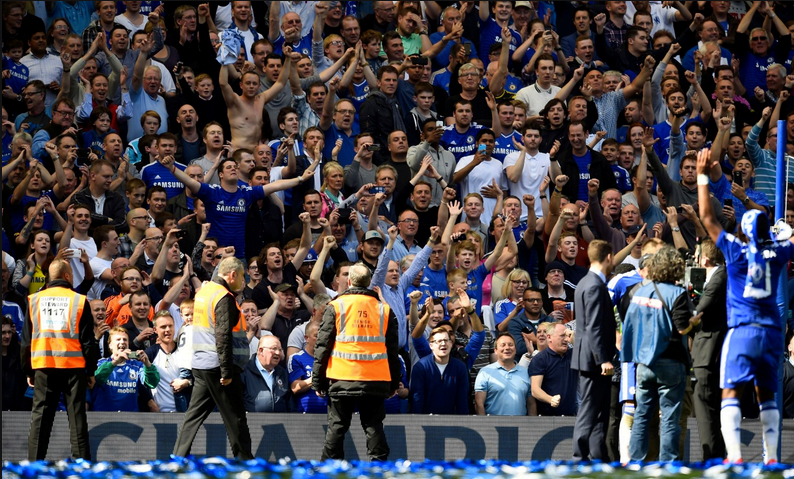 Congratulations to Chelsea FC: 2014-15 Barclays Premier League Champions. Tags: Barclays Premier League, Capital One Cup, chelsea, Chelsea FC, Mourinho, Premier League. Bookmark the permalink.